← Bicycle helmets – To wear or not to wear? VTT Technical Research Centre of Finland Ltd. investigated motorists’ criteria for winter tyre choices. The results of a nationwide survey showed that traction on ice was the most crucial tyre feature, especially for motorists using studded tyres, whereas for users of studless winter tyres, the overall picture tended to be more important. Winter tyres differ in their traction, purchase price, environmental impact, abrasion resistance, noise and other features. The choices facing a motorist when purchasing winter tyres have implications for road safety. A nationwide survey was carried out in Finland with a sample of 1 024 respondents aiming to explore factors affecting winter tyre choices among passenger car users. Stratified sampling was used to ensure regional representativeness, and only respondents who mentioned participating in their household’s passenger car related decision-making were included in the survey. The respondents rated the importance of twelve winter tyre features on a scale of 1 (not important at all) to 7 (very important). In addition, they responded to several stated choice questions. Traction on ice was found to be the most crucial tyre feature, based on both a scale of values and stated choices. 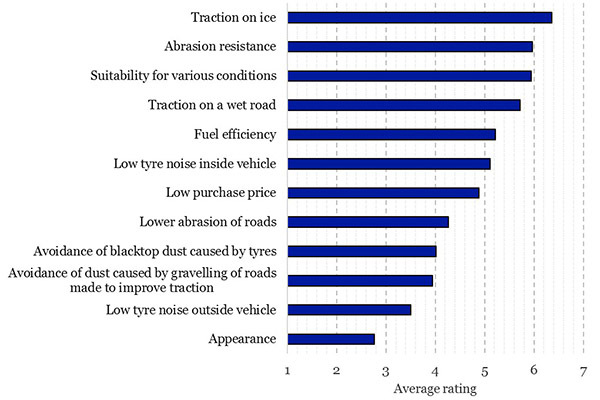 For a majority of respondents, traction on ice outweighed traction on a wet road, environmental impact and purchase price (one-third reduction of price) in stated tyre choices. Traction on ice was most crucial especially for motorists using studded tyres, whereas users of studless winter tyres considered overall picture more important. On a scale of values, the most significant tyre features following traction on ice were abrasion resistance, suitability for various conditions and traction on a wet road. Car and tyre sales representatives seem to have an influence on winter tyre purchase decisions, since most respondents reported receiving winter tyre information from them. This makes sense, since the vast majority of respondents had bought their tyres from car and tyre dealers. Other common sources of information included websites, forums and magazines. Obtaining information from websites and forums was particularly common among young motorists. Even though car and tyre sales representatives were the most commonly reported source of winter tyre information, respondents considered tyre test results and personal experience to be more influential information sources for their purchase decisions. In all, respondents considered winter tyre features related to safety to be important. The results provided up-to-date insights of decision-making considering winter tyre purchases. Relative to traffic safety, the report noted that it is important that motorists making winter tyre purchase decisions get appropriate information, purchase tyres that are suitable to their driving style and conditions, maintain good tyre condition and at the same time do not rely too heavily on the traction of their tyres. 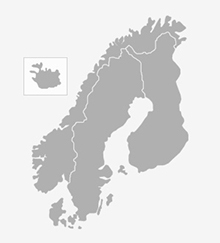 The study was supported by the Traffic Safety 2025 consortium (https://www.vtt.fi/sites/tl2025/en). The current members of the consortium include the Finnish Transport Agency, the Finnish Transport Safety Agency, 21 Finnish cities (Kehtofoorumi), Nokian Tyres Ltd. and VTT Technical Research Centre of Finland Ltd. This entry was posted in Maintenance, Vehicles and tagged winter tyres. Bookmark the permalink.